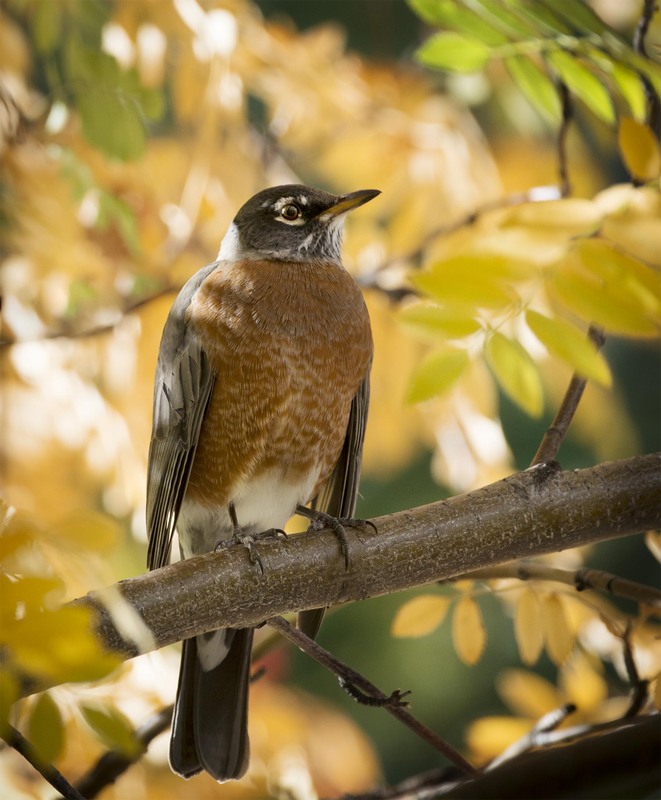 The robins have returned and are enjoying the fall in the forest nearby. We have so many around in spring and early summer and then the vanish only to return as fall begins. I enjoy their company and are grateful for their return to our little woodland nearby. Wherever his summer brooding ground is, he’s come back plump and healthy. Nice capture, Mike! Happy weekend to you both. Thanks Eliza and it is a happy weekend. They never leave in summer in IA. They do go south in the coldest of winter. In the past few winters, flocks have arrived in late winter way too early. There is not much to eat but for dried up crabapples. No worms are available. HI Jim, back at it after a short hiatus so please excuse the lack for response the past few weeks. It is funny around here as Robins seem to some and go depending on temperature in the winter. During real cold spells they disappear only to return in large numbers when things warm up just a bit. We have a certain kind of dried berry that we can be sure to find them eating and protecting in the winter. Hi Mike, what a great pic of a classic bird! The colours are fantastic–well done! Hi and thanks. We are glad to have these guys back in our neck of the woods for awhile. They do disappear if it gets really cold but otherwise they are around all winter in places where dried berries are found. That is one stunning photo of this wonderful bird, Mike! Thanks Pete, this guy is especially good looking in my opinion. Hope fall is treating you well. Hi Jane, Robins are ubiquitous but still one of my favorite birds. Like an old friend. Hope you have a great weekend.